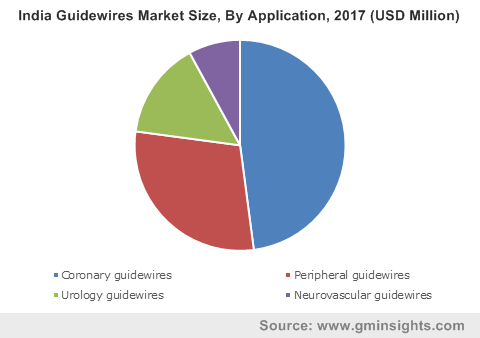 Guidewires Market size was valued at USD 806 million in 2017 and is expected to witness more than 5.5% CAGR from 2018 to 2024. Growing influence about minimally invasive surgical procedures will drive demand for guidewires over the forecast period. Various advantages offered by minimally invasive surgical procedures such as short recovery time and reduction in blood loss will lead to increasing inclination towards adoption of guidewires for various surgical procedures. Other advantages offered by hybrid guidewires include reduction in time and cost of surgery. Growing demand for minimally invasive surgical procedures to prevent post-operative trauma and complications will boost the market growth across the forecast timeframe. Increasing incidences of lifestyle disorders is one of the major reasons for growth of guidewires industry. Many patients from developed countries in North America and Europe suffer from chronic diseases such as obesity, coronary artery diseases, urinary tract infection and other neurological disorders. This is attributable to increasing adoption of unhealthy lifestyle such as lack of physical activity and sedentary work life. 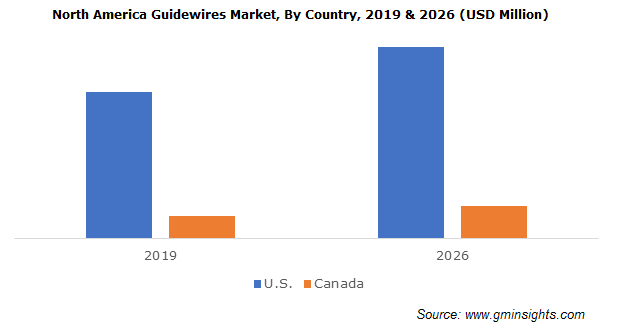 Increasing burden of various chronic conditions in both developing and developed economies will promote guidewires market throughout the forecast timeframe. Various government policies to reduce cost of guidewires will spur the market during the projected timeframe. Center for Medicare and Medicaid Services (CMS) in the U.S. provides insurance cover to about 90% of the U.S. citizens. Also, National Health Services in UK provides financial assistance to people undergoing cardiac surgeries. Such reimbursement initiative will further accentuate growth of guidewires business in developing countries. Favourable policies for reimbursement of guidewires will boost guidewires industry in the future. Coronary guidewires market accounted for USD 368.6 million in 2017 due to increasing number of patients suffering from coronary artery disease. According to report published by American Heart Association (AHA) on heart disease and stroke statistics in 2017, about 90 million people suffer from coronary heart disease annually in U.S. As number of people suffering from coronary artery diseases is increasing, the demand for coronary guidewires will escalate in the future. With availability of advanced and hybrid coronary guidewires, the coronary guidewires market will spur in the future. Neurovascular guidewires market will expand at 6.4% CAGR during the forecast timeframe. As number of people suffering from various neurological disorders is increasing, the demand for neurovascular guidewires will increase in the future. As per Centers for Disease Control and Prevention (CDC) statistics, approximately 7,95,000 individuals in the U.S. suffer from stroke each year of which about 87 percent are ischemic strokes. With increasing prevalence rate of neurological disorders in developed countries, the demand for neurovascular guidewires will increase in the future. Germany market accounted for largest market share of 30.17% in Europe in 2017. Large number of manufacturers involved in guidewires market are based in European region, thereby leading to country growth. Moreover, the approval process of medical devices including guidewires is faster as compared to U.S. and other market due to simpler process of the European Union. Also, increasing number patients suffering from chronic conditions such as peripheral artery diseases and coronary artery diseases will spur market in Germany. Indian guidewires market is forecasted to expand at the rate of 10.8% CAGR across the forecast timeframe. Growth is attributable to increasing patent pool suffering from neurological and cardiovascular diseases. Also, various initiatives taken by the Indian government for promotion of healthcare infrastructure will propel the industry significantly. Availability of foreign direct investment coupled with new opportunities for manufacturers in untapped Indian market will favor industry growth. 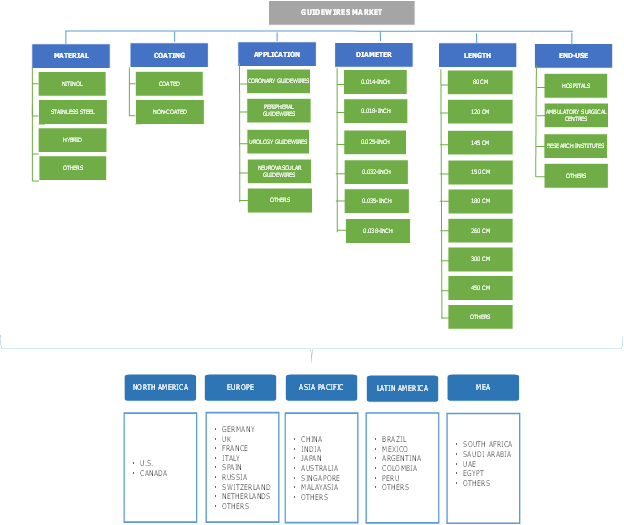 Few of the notable industry players operating in global guidewires market are Abbott, AngioDynamics, Asahi Intecc, B. Braun Melsungen AG, Boston Scientific, Cook Medical, Medtronic plc, Stryker and Terumo Corporation. These players adopt strategies such as new product launch, mergers and acquisitions along with collaborations and partnerships. For instance, in January 2017, Cook Medical announced launch of 2-in-1 hybrid guidewire for urology procedures. This system provides features of a nitinol access guidewire and core safety guidewires. This will enable surgeons to avoid use of two wire guides for the procedure, thereby saving both time and making the system more cost effective. Guidewires were first used for performing first angioplasty in 1981. Various technological advancements have since been introduced for optimizing and advancing guidewires. Currently, major market players are undertaking extensive R&D initiatives to further improve the design and performance of guidewires present in the market. Furthermore, key manufacturers are developing novel guidewire devices that provide real-time imaging and feedback, thereby improving the outcome of the surgical procedure. Advances in technology such as miniaturization and incorporation of microsensors and fibre optics have improved the outcomes of various surgical procedures and broaden the applications of guidewires from coronary diseases to urological and neurovascular diseases. The industry is expected to grow significantly over the next few years owing to increasing number of patients suffering from various chronic conditions. Various government and private players providing insurance and reimbursement for patients undergoing various surgical procedures will fuel industry growth in the future.